Maheshwar is a historic town in the state of Madhya Pradesh and is known amongst tourists for its ancient temples, majestic forts, royal palaces and mesmerising ghats. 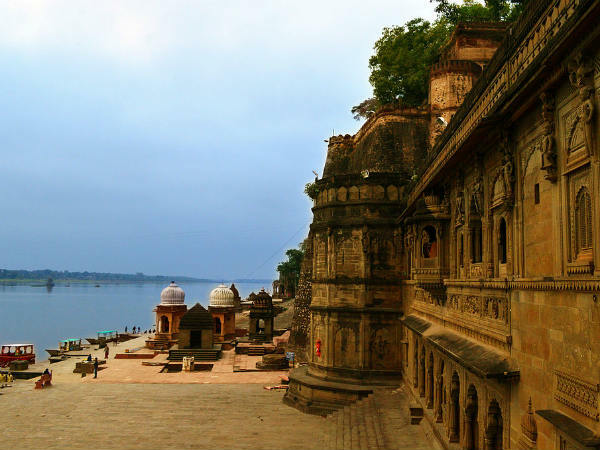 Located in the Khargone district on the banks of Narmada river, Maheshwar is a perfect weekend getaway from the capital city Bhopal to learn about the history and rich culture of the state and the country. With its history dating back to the period before the Common Era, Maheshwar is said to have been established by Haihaya dynasty and served as their capital for a long period of time until it came under the control of other dynasties. It was also the capital city of Holkar kingdom until the early 19th century. So, what do you of a trip from Bhopal to Maheshwar to savour the beauty of its relaxing river ghats and scrutinise the beauty of its ancient buildings? Read on to know more about Maheshwar and how to reach it. The climatic conditions are favourable in and around the region of Maheshwar throughout the year, except during the summer months, i.e., from April to June. Hence, it is not a preferable spot during the summer season for tourists, especially nature lovers. However, for history lovers and peace-seeking individuals, Maheshwar is a perfect weekend destination throughout the year. By Air: The major commercial airport from Maheshwar is located in Indore at a distance of about 100 km and hence, you need to take a flight from Bhopal to Indore and then from there, a bus or cab to reach Maheshwar. By Rail: The best way to reach Maheshwar by rail is to catch a train from Bhopal railway station to Indore Junction and then from there, a cab or bus to Maheshwar. It will take you approximate time of 6 h to reach Indore from Bhopal by rail. By Road: Maheshwar is settled 285 km from Bhopal and therefore, you can easily approach it by road. If you are looking to reach Maheshwar within minimum time, then it is advisable to take route 1 as it will take an average time of 5 h to reach your destination, i.e., 1 h lesser in comparison to the other route. Once you have embarked on your journey, you must consider taking break at Indore too on account of its natural as well as historical significance. Indore is one of the major cities in Madhya Pradesh and is popular amongst tourists for its rich history and culture. Hence, you can find a lot of historical places to explore within its boundaries. Apart from historical aisles, you can also explore the natural beauty of its gardens, waterfalls and other scenic locations. The major places in Indore include Rajwada Palace, Atal Bihari Vajpayee Regional Park, Patalpani Waterfall, Daly College, Lal Bagh Palace, Indore Museum and Annapurna Temple. Indore is located at a distance of about 190 km from Bhopal and 95 km from Maheshwar. Once you are on the lands of Maheshwar, you will be exposed to the treasure of Indian history and culture and hence, you can comfortably unveil the beauty of this river town through its forts, palaces and temples. On the other hand, you can also sit idle by the river banks of Narmada river and gaze at its sparkling waters as they enhance the overall charm of the surroundings. Such is the majesty of this enthralling and elegant spot that it has also been attracting several film-makers for decades, who come here to capture the best of India. Following are a few stoppages in Maheshwar which you shouldn't miss visiting. The land of Maheswar is dotted with several temples and religious sites, ranging from the temples of ancient India to the sites belonging to the Medieval Period. Such is the popularity of its temples that a trip to Maheshwar is always deemed incomplete if you don't explore them, which include Ek Mukhi Datta Temple, Ahilyeshwar Temple, Jaleshwar Temple, Baneshwar Mandir, Kashi Vishwanath Mandir, Pandharinath Temple and Narsingh Mandir. The royal palace and the majestic fort are the most visited tourist spots in Maheshwar and are frequented by thousands of tourists every year. Built by Maharani Ahilyabai Holkar, the queen of the Holkar dynasty, these magnificent buildings are a treat to savour for history lovers as well as architecture enthusiast. The ghats of Narmada river in Maheshwar are a few spots which one cannot merely ignore. The positive ambience, pristine surroundings and peaceful atmosphere make these beautiful ghats the ideal spots to get lost in the ecstasy of nature. From lazing by the soothing waters of Narmada river to enjoying its panoramic views, these ghats offer its visitors a lot. Maheshwar has many spots that narrate the beautiful stories and legends from the past and so, it is really impossible to explore everything and extract it entirely on your camera. Therefore, apart from all the above-given places, you can also witness the majesty of Kaleshwar, Chhatris of Ahilyabai, Chhatri of Vithoji and several other temples, such as Chintamani Ganpati Mandir and Ram-Krishna Mandir. If you are always keen on shopping, then you can also explore the liveliness of the gorgeous markets at Maheshwar.